I can't decide whether I like mung ka dhokla more or the regular instant dhokla made with besan. These are the two variants I make more but a corn dhokla is also a winter favourite. Dhokla is a steamed 'bread' made using lentils and tempered with a mix of ingredients that make it nice tart, sweet and hot. 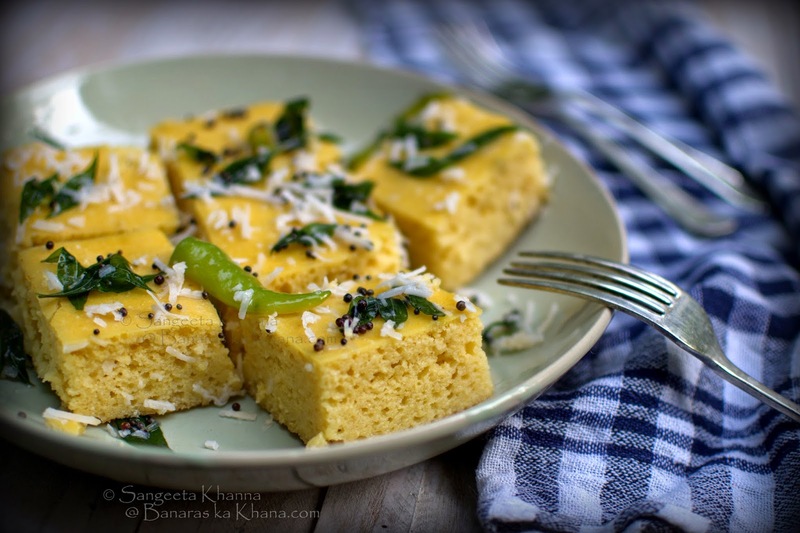 Dhokla can be served as a gluten free snack, an appetizer or even in a thali meal. I wouldn't mind some dhokla with a salad though. Mung or moong ki daal is skinned mung beans considered very easy to digest and fairly rich in protein. Mung ka dhokla is a steamed bread that is served cold with a tangy hot and sweet tempering that makes the dhokla quite moist and soft. Actually I would say all types of dhokla are basically steamed lentil breads way more superior than the white commercial breads. Very similar to corn breads of Mexico but served differently. The Indian punch is unmistakable in a dhokla which is specifically a Gujrati riot of flavors. 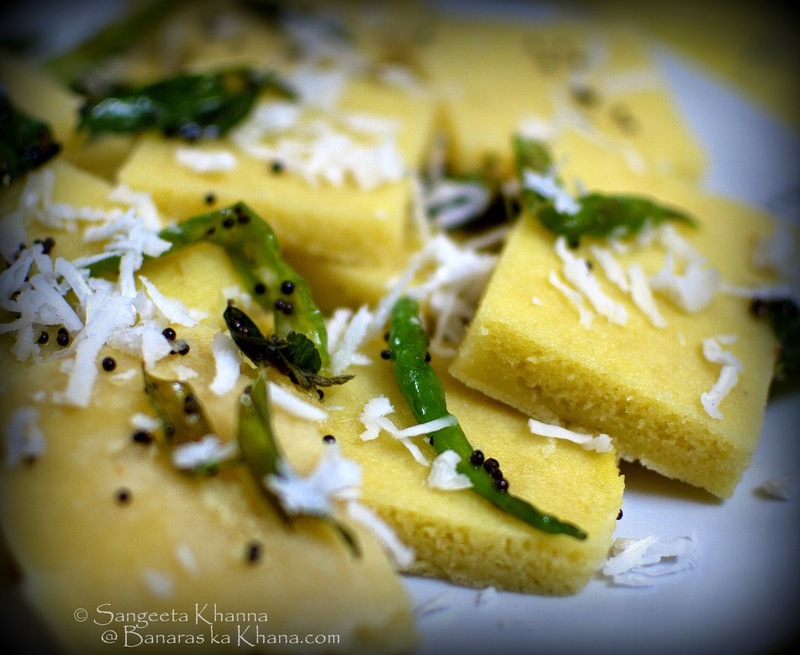 Besan ka dhokla is more common in our homes and most sweet shops all over north India. Everyone likes the dhokla with varying combinations of sweet, sour and hot flavours melding together with some coconut, sesame and mustard seeds in the tadka. I skip sesame most of the times although I love sesame otherwise. May be because I grew up loving the dhokla without sesame. Mung ka dhokla is not very common but I started making it quite by an accidental lie I had to speak. Yes I do lie sometimes but I always have valid reasons for it. The valid reason for this lie came in the form of an unexpected query about the usual besan ka dhokla I had made one day. This was at my in law's place and I was a new bride on a spree to impress everyone with the things I could do. So the dhokla that day was appreciated a lot and after eating a few fat pieces of dhokla my father in law asked if those were 'mung ka dhokla'. I was startled at this question as I had got to know he can't digest besan that well and he had already eaten a lot of dhokla for my comfort. I said yes it is moong ka dhokla just to not panic him. He did not have any indigestion issues that day thankfully but then he started demanding for mung ka dhokla quite often. Later on I made the real mung ka dhokla but I wonder how could he not know the taste the first time. This time when I visited my in laws for an extended weekend I was reminded of how he wanted mung ka dhokla last time I had gone and I could not make it then. I had time on hand this time around and made this one dish for everyone to enjoy. There are special utensils for steaming dhokla but not to worry if you don;t have them. Keep a large vessel ready to boil water over which a metallic strainer will be placed. The dhokla will be steamed in a flat based thali (or large baking dish) kept inside the strainer and covered. You can steam dhokla in idli steamer as well. Soak mung daal overnight and grind without added water the next morning. Soaking the mung daal for at least 4 hours is required so keep it ready if you need it in the evening. The paste should look like idli batter or loose cake batter in consistency. Add salt and soda bicarb and mix really well. Pour the batter in one or 2 greased thalis depending on how large your steaming vessel is and how thick (tall) dhokla you want. Place on the steamer contraption and steam for about 15 minutes or till a knife comes out clean. 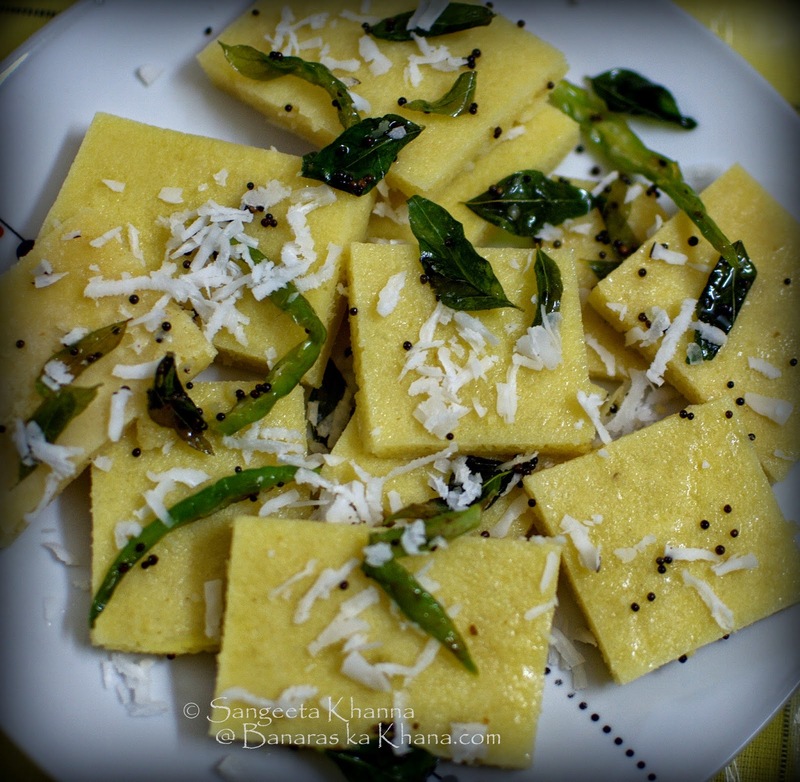 Cool and make cuts into the steamed dhokla. Prepare a tempering to pour over it. To make the tempering, Heat the oil and add hing to it. Now tip in the mustard seeds, green chillies and curry patta and let them cook a bit. Now pour 1 cup of water and add sugar to the mix. Let the mixture come to a boil before taking it off the flame. Add the lime juice and pour over the steamed dhokla. Let it rest till the dhokla soaked up all the water and tempering. Serve as desired, garnished with grated coconut. This dhokla stays well for 8-10 hours on room temperature. I like mung ka dhokla better than the besan ka dhokla that I make at home. I think mung ka dhokla has it's own taste that grows on you. But Arvind likes the besan ka dhokla better. We rarely have common food choices you know. I suggest making thinner dhokla when making it with mung daal as the rising is better this way. Or else you can add a tsp of fruit salt to the batter to make it rise more. Looks yum and I like those thin slices. Definitely my kind of snack!!! hi . cool dish. next time, make it on the skillet, wrapped in banana leaves. Known as panki, take small piece of banana leaf, apply a thickish batter, cover with another piece. apply oil on the outside. cook on medium heat on open skillet. it takes the flavour to another level. Oh wow. Thanks for this recipe of panki. Will cook panki really soon and update on this blog.